Way back in September I shared a blog post featuring some of my favourite Autumn haircare. Some of the products in this post I am still currently using to this day, and others I have replaced with something new. My Winter haircare routine is much more thorough and my hair needs all the hydration and nourishment to battle the cold, harsh weather. I've recently tried and tested some new haircare that I've added to my haircare routine, and that leave me with beautiful, shiny and healthy hair. Let's take a look! The most recent addition to my ever changing haircare routine has been the newly released Charcoal Shampoo from Soap and Glory. It's unlike any other product I have ever used! Formulated with bamboo charcoal and apricot seed exfoliators, this helps cleanse and refresh the scalp as well as removing product build-up and leaving hair feeling ultra-cleansed. My hair looks nourished, healthy and bouncier! The first time I used this, it felt extremely weird, I could feel the small exfoliating bits being massaged into my scalp, but after a while you get used to it and it does a pretty good job. Scented with notes of grapefruit and bergamot, it leaves your hair smelling pretty damn good. If you've read my previous haircare posts, you'll already know that I'm a massive fan of Aussie Haircare. They've recently brought out a few new haircare products that I just had to get my hands on, and I opted for the Aussie Scent-Sational Smooth Conditioning Mist. A perfect product to use that gives your locks a shiny boost and add gloss to every strand. It promises to leave your hair smelling delightful with a 48h scent-sational fragrance. I can smell this so strongly when I brush through my hair and it lingers all day long. Something that I recently saw on Instagram and decided that I needed to see what all the hype is was the Siliscrub Scalp Brush. At first I thought this was a bit of a gimmick product, but after a few tries, I actually really enjoyed using it. It's built to exfoliate and cleanse the scalp, boost hair growth, eliminate dandruff, and get rid of scalp troubles. It uses soft silicone bristles to brush over the scalp whilst shampooing, and helps you to maintain a healthy scalp by gently lifting away dead skin cells and impurities, and increasing blood flow. It feels like a deep head massage and is the best way to shampoo your hair. It left my hair feeling a lot cleaner and much bouncier. I managed to get around 4 days without washing. I also noticed that my hair had less product build up in the roots, and didn't get greasy/oily as quick. After discovering my love for the L'oreal Dream Lengths haircare range, when I saw that they had released a new innovative hair mask, I was all over it! The mask itself follows a 2 step system: Step 1: features a thick balm that you apply from root to tip and leaves the hair feeling immediately nourished. I like to comb the product through so I am sure all my hair is completely covered in the mask. Step 2: A tissue cap infused with a self-heating lotion. You can leave this on for around 10 minutes, or longer if you want a deeper condition. From the very first application, the results were incredible. Silky soft, beautiful hair! Even my dry ends were no more! Would highly recommend! This absolute gem from The Body Shop has been my life saver this winter when it comes to haircare. It's been my go-to hair mask with amazing results after every single use. I tend to use this product once-a-week as a deep conditioning treatment, applying the mask all over my hair, focusing on the mid-lengths to ends as this is where I see the most damage and dryness. Enriched with a blend of natural ingredients, including organic Banana puree from Ecuador and Brazil Nut oil from Peru. It leaves hair feeling intensely nourished from root-to-tip, banishes frizz and my hair looks instantly shinier and glossier, all without being weighed down. Another huge plus to this product is the scent. It takes me way back to my childhood of having Nesquik Banana milkshakes and foamy banana sweets. The smell is so fresh and fruity, it's insane. What products are in your Winter haircare routine? What would you recommend for dry, heat damaged hair? 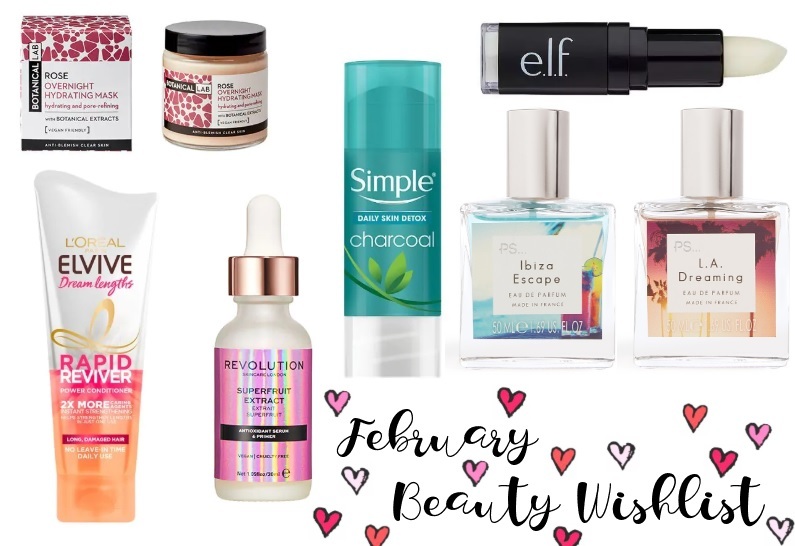 It's been a while since I've published a wishlist styled blog post, and right now there are some amazing beauty products that I want to get my hands on. My last wishlist was from way back in December, so I thought it was about right that I post one asap! First up is the Botanical Lab Rose Overnight Hydrating Mask. Priced at just £6.99, I think this mask will be a great skincare staple for the colder weather we have right now. This Hydrating Mask states it will help plump up your skin helping leaving it hydrated and smooth - a must have for winter skincare! Infused with a blend of Rose flower oil and hyaluronic acid it should help to deeply hydrate thirsty skin. A must buy for happy, hydrated skin this winter! I've mentioned products from the Dream Lengths range before on my blog, and they have become a staple in my haircare routine. Recently, I've noticed something new to this amazing range - Rapid Reviver Treatment for Dream Lengths. At an affordable £5.50, this promises to be an intense conditioning product infused with an Amino Acid and Castor Oil. It also claims to contain twice as many conditioning ingredients versus a classic conditioner - goodbye dry and broken hair - hello healthy and strong hair! Revolution Skincare Superfruit Extract Antioxidant Serum has been hot on my radar for a very long time since I tried out one of their skincare products before and LOVED it. This product would be the perfect base for healthy, glowy skin, with or without makeup. It looks to be quite a lightweight serum and primer which will hopefully leave skin feeling soft, while subtle iridescent shimmer creates unbeatable glow. Perfect for getting that summer skin in the cold months. At only £9.99, it's definitely a great drugstore find! Korean skincare seems to be all the hype these days and skincare brand Simple have released their Daily Skin Detox Charcoal Cleansing Stick which seems very innovative and interesting to me. The concept of the product was what really drew me in as it is formulated to deeply cleanse and purifies pores with just one swipe! Dry, chapped lips be gone! I need to get my hands on the e.l.f. Lip Exfoliator. The Coconut formula is what I want to try. I love all things coconut. I've used the normal version of this before in the past and it definitely works well. Gently exfoliating the lips to remove dry, chapped skin, due to being infused with Vitamin E, Shea Butter, Avocado, Grape and Jojoba Oils to nourish and protect. At just £4.50, it's an absolute steal and a makeup bag essential! If you've read my blog before, you will already know that I'm a huge lover of Primark Fragrances. I've tried both the PS Rose Gold and PS Love Noir and found them to be incredibly good. Primark have recently announced a new fragrance collection inspired by holiday destinations. I'm totally crushing over Ibiza Escape (with watermelon, pear, Tiaré flower, toffee and white musk) and L.A Dreaming (with bergamot, lime, pink pepper, neroli, blueberries, orchid and musk). At just £3.00 each for a 50ml, this is such an incredible price, and I know from my previous experiences that they are bound to be great! What beauty products are on your current wishlist? Have you tried any from mine? "Indulge and pamper with the Superdrug ‬‭Hair Therapy haircare range, designed ‬‭to cater to all your haircare needs and ‬‭help give your hair back its sparkle!‬"
The Superdrug Overnight Treatment ‬‭Masque is a super affordable and the perfect haircare saviour for those with dry or damaged hair. It has been specially formulated ‬‭to deeply condition and smooth your ‬‭hair for a little extra TLC - perfect for winter. Enriched with a unique blend of natural ‬‭Argan and Kukui Nut Oils that are bound to leave your hair in tip-top condition.‬ What more could you ask for? This hair mask has such a silky smooth texture, that it simply glides through the hair upon application. I like to apply this to damp or dry hair before bed, and comb through to make sure all the mid-lengths to ends are fully conditioned. I tend to not put any on the roots of my hair, as this can lead to product build up and making my hair look/feel greasy. If I don't have the time to leave this argan masque on overnight, I would use it just as a deep conditioner when washing my hair normally, using it after shampooing, as I find this works just as well. Once I've washed the product out, dried and styled my hair, I definitely notice a difference and it feels so much softer and silkier. The texture definitely improves and my drier ends are revived. It also adds such a shine to my hair, due to the wonder oils that are packed into this product. If you're looking for a new haircare product that will really help improve the texture and appearance of dull, dry hair, this Superdrug Argan Hair Therapy Overnight Masque should be on your list! Have you tried Superdrug Argan Hair Therapy Overnight Masque or any other products from the Hair Therapy range? Who says Valentines is just for couples? You know that day that if you’re totally single reminds you that you’re totally single. Fear not, make this Valentine's Day all about you. A day to celebrate your achievements, to pamper yourself and most importantly to love yourself! Rosina's Lotions & Potions have kindly gifted me a selection of their amazing products wrapped up in a beautiful gift box, including the Kale and Pomegranate Face Mask*, the Rose-Scented Signature Rosina's Candle*, the Rose Perfecting Oil* and a Rose Bath Bomb*, to help me create the perfect pamper evening this Valentines. "Rosina's Lotions & Potions came to life in 2008 as an alternative to chemically laden modern skincare. With an initial dozen products and the brand has quickly grown to be an industry leading skincare and bath accessories company featuring vintage-inspired product design and history. The company was founded by Sophie Cooper who spent most of her youth either helping at one of her mother’s skincare clinics or stirring up pots of beautiful potions in her grandmother’s kitchen. Using Rosina’s unique recipes and her mother’s technical know-how Sophie created what would become one of the UK's leading natural luxury skincare brands." The Kale & Pomegranate Mask is an amazing multi-tasking treatment, that you can use as a cleanser, mask and exfoliator all in one. After using this mask on fresh cleansed skin, even after the first use, my skin appeared much smoother, healthier and more radiant. The pomegranate helps to gently exfoliate the skin to reveal a smoother, brighter complexion while the organic kale will make skin feel more supple and plump. Can we just take a moment to admire the beauty and simplicity of this gorgeous hand-printed glass candle. Whilst burning, the candle fills your entire room with a beautifully perfumed rose essential oil, that helps to build and create that perfectly peaceful atmosphere when you want to relax and de-stress. A candle 100% worthy of featuring in a pamper night as it really helps to set the calming mood. Rosina's Rose Perfecting Oil is a delicate, but deeply moisturising, facial oil. Enriched with the healing properties of Helianthus, Argan Oil and precious Rosa Damascena. It is a facial oil rich in nutrients, antioxidants and vitamins. I like to use this Rose Oil as part of my evening skin routine, so it can absorb into my skin overnight, and I wake up with a plump and hydrated complexion. A much needed skin pick-me-up for dull and dry winter skin! This gorgeous rosy pink handmade luxury bath bomb is packed with moisturising agents, anti-ageing properties and a delicate fragrances for a truly replenishing soak that leaves the skin super soft, moisturised and subtly-scented. As soon as you pop it into the bath, it bubbles and fizzes like crazy, filling the bathroom with a fresh and warming rose aroma. It's so calming yet invigorating, it's the perfect bath bomb scent to use before bed! What are your plans for Valentines Day? What are your pamper night essentials? When it comes to skincare, face masks are one of my favourite products that I love to chop and change based on my skins needs. Whether your skin is dry and needs hydration, your skin is dull and needs brightening or your skin is oily and needs detoxing, there is always a face mask for every occasion. I was recently introduced to PROCOAL London; a company focused on producing high-quality beauty products using traceable and ethically sourced ingredients at revolutionary prices and use business to inspire and foster positive social change. I was kindly gifted their Marine Moisture Masks* to try and test out for myself, and help combat my winter skin. The box contained 4 x Sheet Masks - each sheet mask contains roughly 25ml of extract rich serum. These definitely reminded me of the Garnier Moisture Bomb masks. Nutrient-rich Marine Ferments: Marine ferments deliver powerful antioxidants and help the skin to retain moisture. Botanical Extracts: Potent blend of botanical extracts help nourish and hydrate the skin. Pro-Vitamin B5: Helps to keep skin soft, smooth, and healthy. Deeply hydrating, it helps to keep skin quenched by absorbing moisture from the air. These cutting-edge, easily absorbed moisturising facial sheet masks are suitable for all skin types, especially those who have dry or dehydrated skin and are in need of a serious moisture boost. Upon application these masks feels super cooling and fresh against the skin. You can feel the instant hydration. The mask itself has a very wet texture, due to the large quantity of serum included, that smoothes easily over the skin and moulds to the face very easily. 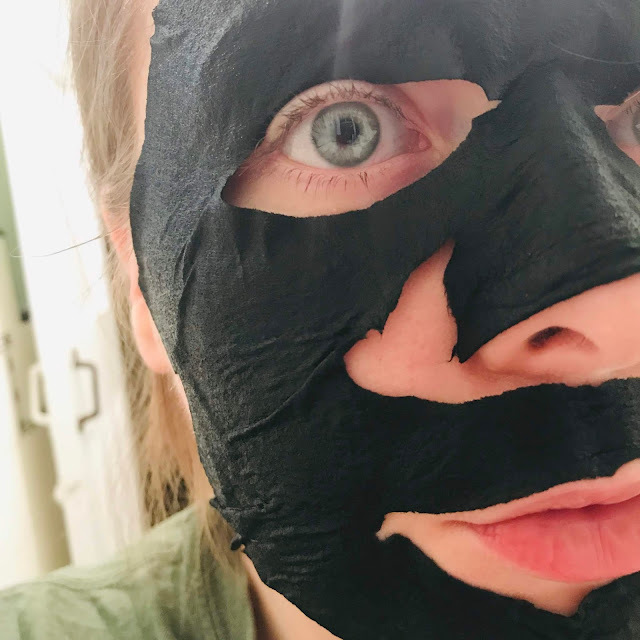 Once the face mask has worked its magic for around 20 minutes, I was extremely happy with the instant results from the first use of the PROCOAL London Marine Moisture Mask. My skin was left so plump and hydrated. It was the perfect product to use of my dry winter skin and will definitely become an essential in my skincare routine whilst we still have this cold weather. I was left glowing, my complexion was so much more radiant and bright. It was definitely the skincare pick-me-up I needed! Have you heard of PROCOAL London before? What are your favourite sheet masks? * AD - This post is in collaboration with PROCOAL who have kindly gifted me samples for a product review. If you saw my last Primark perfume review which was Primark PS Love Noir, you will know that I was super impressed with that fragrance. It had become my everyday perfume and also my handbag staple. But recently whilst I was in-store, I came across a brand new, limited edition scent that I knew I had to get my hands on - the PS Love Rose Gold Perfume. "This intimate sensual scent is a powdery floral blend of tender jasmine and raspberry blossom on a bed of pink hyacinth." This limited edition fragrance caught my eye as soon as I found the beauty department in my local Primark store. Isn't the packaging just stunning?! The bright orange toned gold box is something that you could probably see from the other side of the shop, and it just called my name. The scent itself is completely different to that of PS Love Noir. Rose Gold has a more fresh and floral scent, that is very warming on the nose. To me, this perfume would be more spring/summer appropriate in comparison to my other Primark perfume. With a powerful floral base and sweet hints of raspberry coming through, it's the perfect girly fragrance to wear both day and night. If you're on the lookout for a new fragrance or just something a little more inexpensive for daily wear, PS Love Rose Gold could be your everyday perfume. The lasting power of this fragrance is pretty impressive. You can give yourself a few spritzes in the morning and by bedtime, you will still be able to smell it lingering on your skin. With a super affordable price and a great travel sized bottle, perfect for keeping in your handbag for day-to-day use, it's one definitely not to miss! Have you tried any perfumes from Primark? If you caught up with my latest monthly favourites post for December, you would have seen that I included the GHOST Eclipse perfume. It had been my go-to fragrance for the entire month, to the point where I had been wearing it pretty much everyday and my bottle is nearly empty after using it so much since I purchased it way back in June last year. The bottle itself is absolutely stunning. With an ombré effect, a clear glass to a rich, deep orange colour, in GHOSTS signature half moon shape with a rich gold coloured cap. It's so bold and vibrant, and so beautiful to look at, it's a great fragrance to add to your perfume collection. It's a very playful, addictive and feminine scent which could be worn for any occasion, both day to night. Bursting with very fresh, fruity and floral aromas, with hints of fresh lemon, mandarin, apple and peach, it's a perfect fragrance for summertime, but I like it all year round! It also features deeper and warmer base notes of amber and musk, that really add depth to the fragrance. It's simply unforgettable. The lasting power is of this fragrance is unbelievable. I carry this with me in my bag for when I'm on the go, yet I never have to top this up as it lingers all day long. I can spray this on in the morning and still smell it before I go to bed. I have received so many compliments when wearing this and people always ask me what scent I'm wearing. It's definitely become one of my favourite scents. 100% will repurchase! Have you tried GHOST Eclipse before? What are your current favourite perfumes? Do you wish for that perfect natural, healthy glow all year round? Then look no further as the Beauty Sleep Elixir Facial Oil* by Beuti Skincare is the perfect skincare product you need to give a radiance boost to your complexion. Firstly, the Beauty Sleep Oil comes in a small teardrop-shaped glass bottle with a plastic pump dispenser. The pump is a nice way of dispensing the oil as it's not too fussy or messy. Its oily texture is rich but super lightweight, so it absorbs into the skin pretty quickly. If you hate oils that leave a greasy and sticky feeling on your skin, you’ll love this one! The oil is a rich looking orange colour, which is quite runny once dispensed. The first thing that hits you is the amazing fragranced scent, a real blend of natural oils, providing such a natural, fresh and earthy aroma. Very spa like! The Beauty Sleep Elixir is a super versatile product that you can choose when to apply it. Whether it be in the morning, to help wake up and brighten skin, or wearing under makeup, to help it go on smoothly and give that subtle glow or at nighttime before you go to bed to allow you to wake up with plump and hydrated skin. I've been using the Beauty Sleep Elixir for just over a month now and it really has made such a difference to my skin. I have found that my ideal application would probably be 1 1/2 pumps of the product. This allows me to cover my entire face and have a little bit extra to go over my drier patches of skin. I mainly use my Elixir just before I go to bed, applying a small layer to my freshly cleansed skin and I wake up the next morning with gorgeous glowing and plump looking skin. I've noticed a change in my skin from the first application, but of course the long term benefits are going to be even more impressive and that's what I've been starting to see over the last month. My skin has become much more hydrated and I have few dry patches. The Elixir has helped to brighten and add glow to my complexion, as well as beginning to even out my skin tone and prevent any redness. Have you tried the Beauty Sleep Elixir? What are your favourite products for healthy, glowing skin? Back in 2015, I blogged about The Body Shops festive range for that year, and I was blown away with the scents that they had produced for that season. Since then, I kind of forgotten about them, until recently an email popped up in my inbox with a discount code for the website that I needed to take advantage of. 40% off is crazy, but it definitely justifies a good haul! Peppermint Candy Cane - Infused with the uplifting scent of peppermint candy canes. Strong and fresh minty aromas, with a hint of sweetness. Vanilla Marshmallow - Enriched with vanilla extract from Madagascar, this sweet, warming and creamy range has the seasonal scent of sweet vanilla and marshmallows. Berry Bon Bon - Enriched with cranberry seed oil from the floodplains of North America, this juicy and fruity seasonal scent that is packed full of delicious winter berries. First up, festive bubble baths. Is there anything better than a hot bubble bath on a cold winter evening?! I don't think so. So I've picked up the Peppermint Candy Cane Bubbling Bath Foam & Vanilla Marshmallow Bubbling Bath Foam. These bubbling bath foams produce so many bubbles and fill the room with such strong, fresh aromas. You're bath will definitely be bubble heaven! I've been completely obsessing with the Berry Bon Bon Body Lotion ever since my order arrived at my house. It's that good, I've already stocked up on 2 more bottles! The scent is just so fresh and fruity, it lingers on the skin for hours. The body lotion has such a rich, creamy formula, it feels so nourishing and moisturising on the skin. Enriched with Cranberry Seed Oil extract from North America, this keeps the skin feeling softer and smoother all day long. The perfect handbag essential this season, and I've got both the Vanilla Marshmallow Hand Cream & Peppermint Candy Cane Hand Cream. With a light, non-greasy formula, these hand creams leaves your hands feeling softer and smoother. It works wonders for dry, winter skin! They are a great size for taking with you on-the-go or for travelling. They have become my new cold weather best friend. I've used plenty of The Body Shops shower gels before and they are definitely one of the best that I've ever tried. One of my favourites is the Wild Argan Oil Shower Gel. That stuff is super moisturising on the skin and has such a unique, fresh scent. But for Christmas, I've picked up both the Berry Bon Bon Shower Gel & Peppermint Candy Cane Shower Gel. These shower gels lather up so well, you only need the smallest amount ever. The scents last on your skin for so long! Overall, I'm super excited about the ranges that The Body Shop have brought out this year. I didn't think they could get any better, but this year they have definitely taken it to a whole new level! They've outdone themselves and literally combined all my favourite scents into their seasonal range for this year, it's just a shame they are always limited, as I would love these all year round. Especially the Berry Bon Bon Body Lotion and the Peppermint Candy Cane Bubbling Bath. If you're looking to try anything from the 2018 festive range, those are the 2 products I would highly recommend. They are INCREDIBLE! What is your favourite festive scent from The Body Shop?